Something I secretly love about my weekly organic produce box is the little challenge put before me every time I bring it home and open the paper wrapping to reveal the mystery contents for the week. 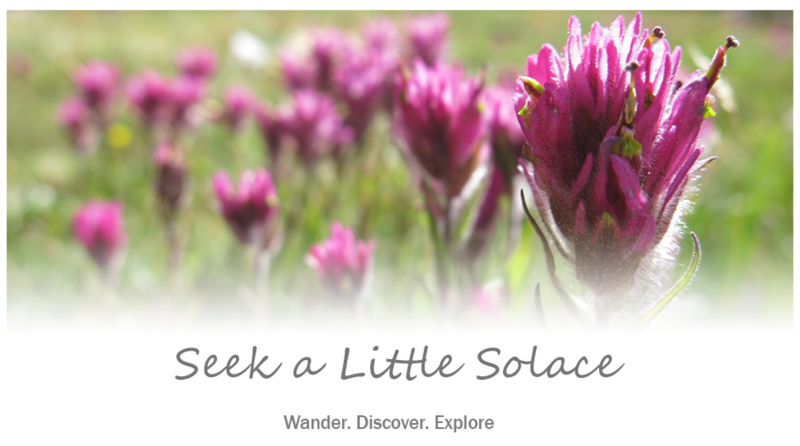 Being locally grown, organic, seasonal produce, it is not always a surprise to find certain things at certain times. One would expect to find apples in autumn, squash in winter, strawberries in spring and green beans in summer. But what I love is the combination of ingredients presented each week and the adventure in figuring out some deliciously different way of using them. 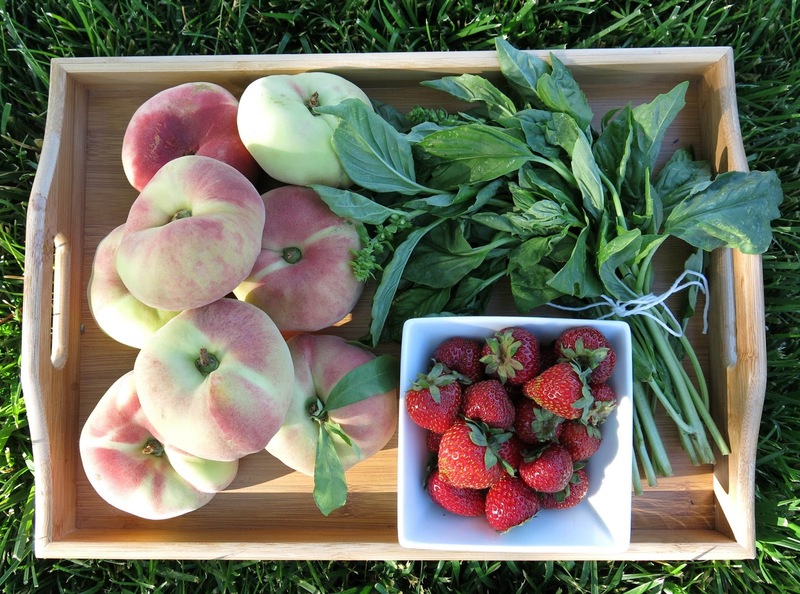 Last week’s challenge combo was a big bunch of fresh basil, a whole lot of sweet juicy peaches and strawberries. Hmm…what to do with this? ‘Tis the season of stone fruits right now and we have been swimming in summer peaches. Sweet, juicy peaches are a treat to eat on their own, plain and simple, right out of the box. However, being organic they don’t keep for too long and you have to be quick about consuming them. It’s always a lot of fruit for just the two of us to eat right out of the box, so I am always looking for new and creative ways to use it. Sure you can wash them, cut them up and toss ’em in the freezer for smoothies, but what fun is that? Well, salad is always a safe place to start. It is kind of hard to go wrong with salad. 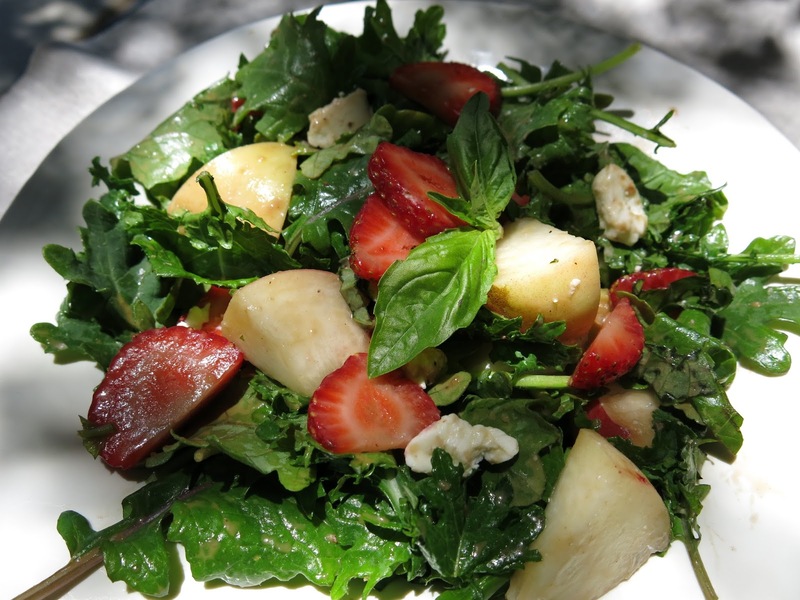 Wash your greens, pile your plate with fresh veggies, fruits and herbs, dress it up and it rarely goes awry. 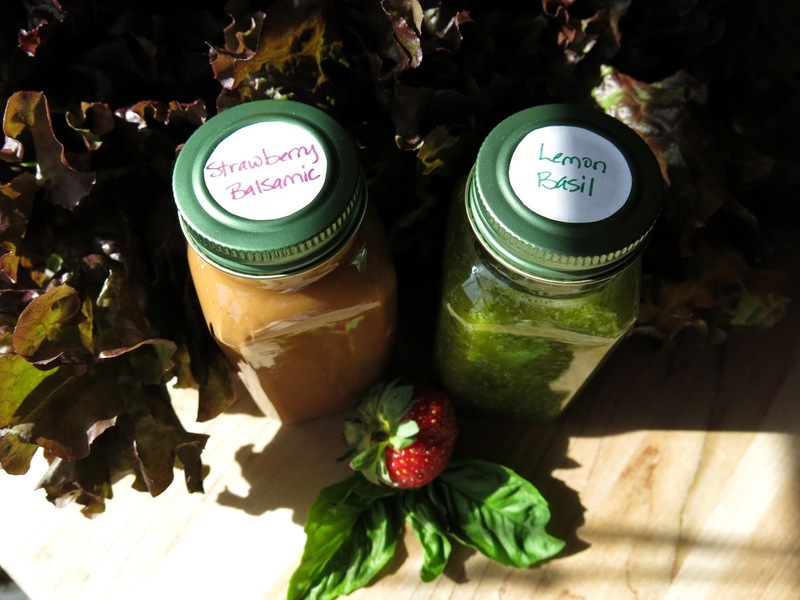 I do love having a variety of homemade salad dressings on hand for quick and tasty workday lunches, so I used the basil and the strawberries to create two different vinaigrettes: Lemon Basil and Strawberry Balsamic. Blend all ingredients in a food processor or high speed blender. Pour and enjoy! The lemon basil was such a delicious addition to our plain old dinner salad and it was gone before I could get creative with it. No matter. 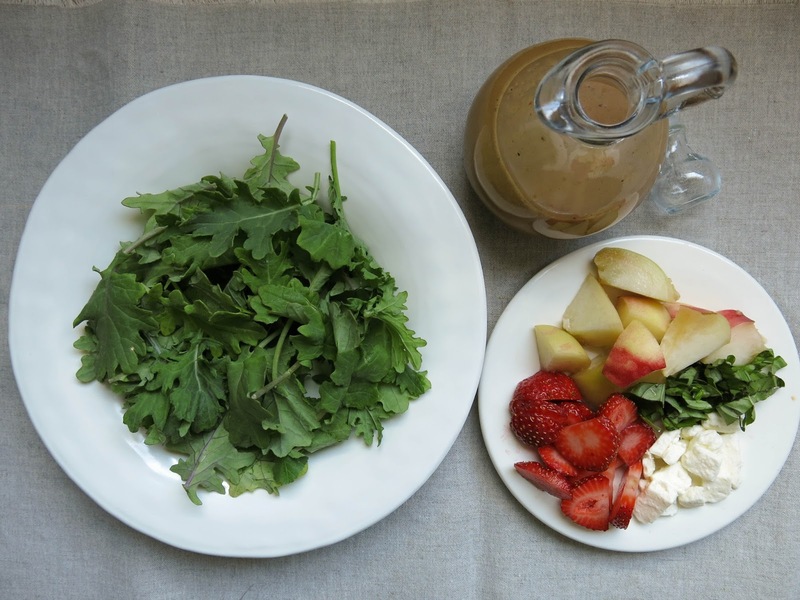 The strawberry balsamic was plentiful and I thought it might pair nicely with my peaches and some greens, so I set out to concoct a light and fruity salad to fit the summer mood. My first attempt, though nice enough, didn’t quite hit the spot for me. 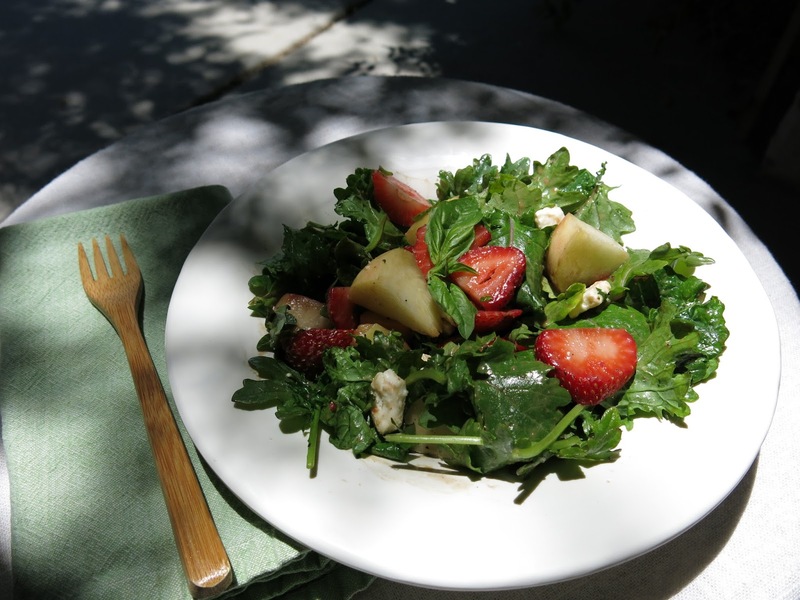 I piled my plate of baby kale with peaches, strawberries, avocado and pecans and drizzled the dressing on top. It turned out to be a bit heavy and the the flavor combination just wasn’t quite what I imagined. So I gave it another try. This time I left out the nuts, added some fresh minced basil and a little bit of feta in place of avocado. 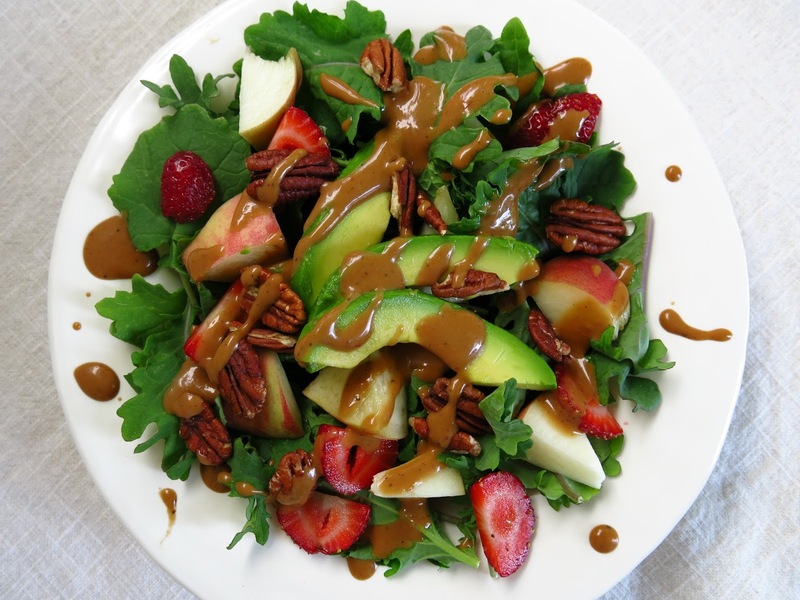 Lightly tossed with just a little bit of strawberry balsamic vinaigrette…ooohhh! That was the winning combination! Just the thing to savor for a light summer supper in shade of the patio. In a blender or food processor, combine the mustard, agave, balsamic vinegar, garlic salt and pepper. Pulse to combine. Add strawberries and mix until a smooth consistency is reached. With processor or blender running, slowly pour in the olive oil. Mix until dressing is emulsified. Next up was salsa. 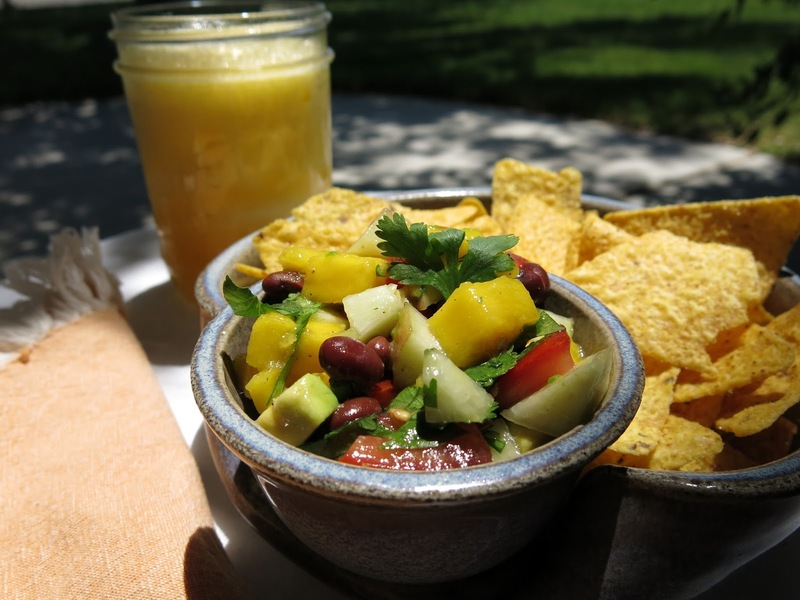 Peach and mango salsa with black beans, avocado, tomato, cilantro and a side of organic corn tortilla chips. 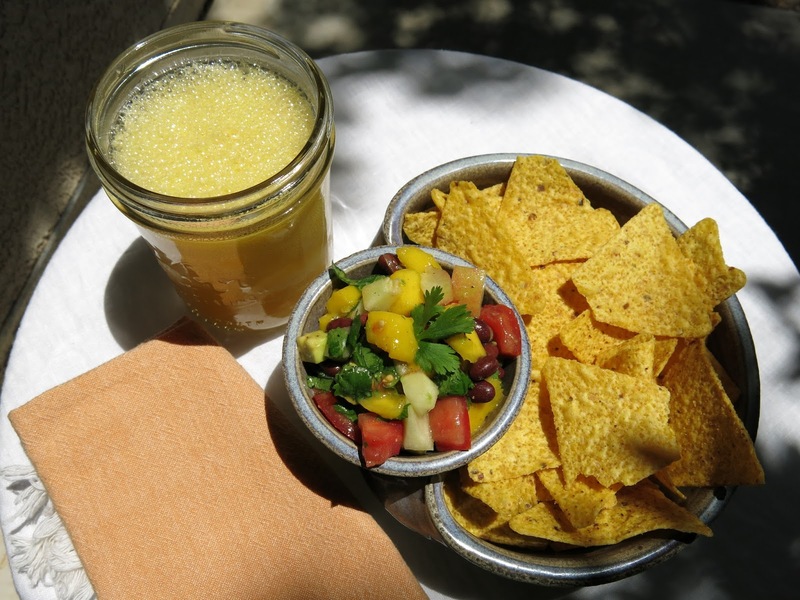 Accompanied by a cool and frothy whole fruit Summer Citrus Margarita, it made for a perfect late afternoon snack on a hot summer Saturday. My hubby tells me this would be really good with a little kick from some jalepeno and diced onion. I know, I understand…I just cannot do that spicy bit. But you would probably want to add it in. Unfortunately, for the recipe lovers out there, this was one of those dishes that just sort of happened. In keeping with my use what you have, toss some in a bowl, add a little more of this and a dash of that, cooking style, I don’t really have a recipe. 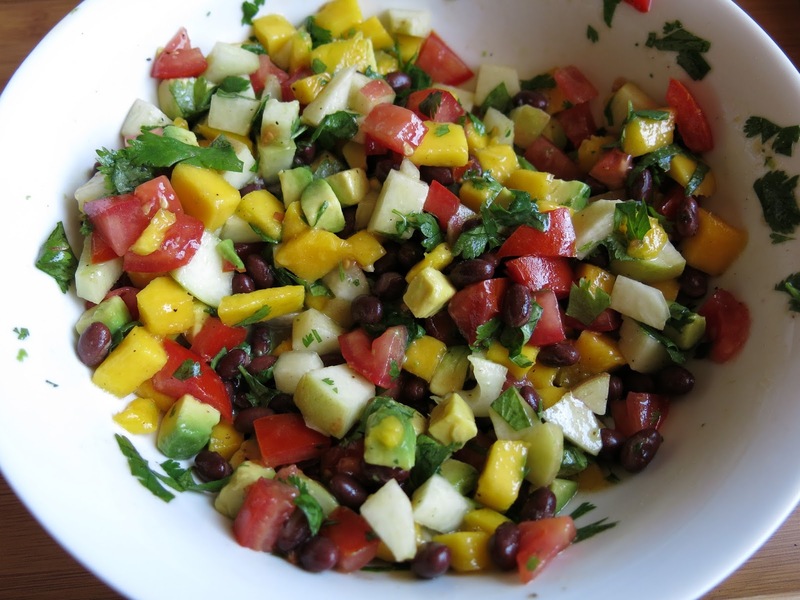 I simply chopped up about 3/4 of a mango, 1 large white peach, 1 avocado, 1 tomato, 1/2 can black beans, a large handful of cilantro, the juice from 1/2 lime and salt and pepper until it tasted good to me. This is a sweet and not-at-all spicy version. Like I said, a proper salsa would include some diced red onion and a little jalepeno pepper. Just as I was beginning to make a dent in the peach supply, along came the plums. Mmm, delicious! Sweet, yet tart. Totally tasty with a dollop of coconut milk ice cream and granola sprinkles. Yet still, I found myself in complete summer stone fruit overload. What to do? Often times when I find myself overwhelmed in beautiful, organic, I-cannot-waste-this fruit, I find it wise to turn it into fruity chia seed jam. Simple. Healthy. Fresh. Raw. Pure. 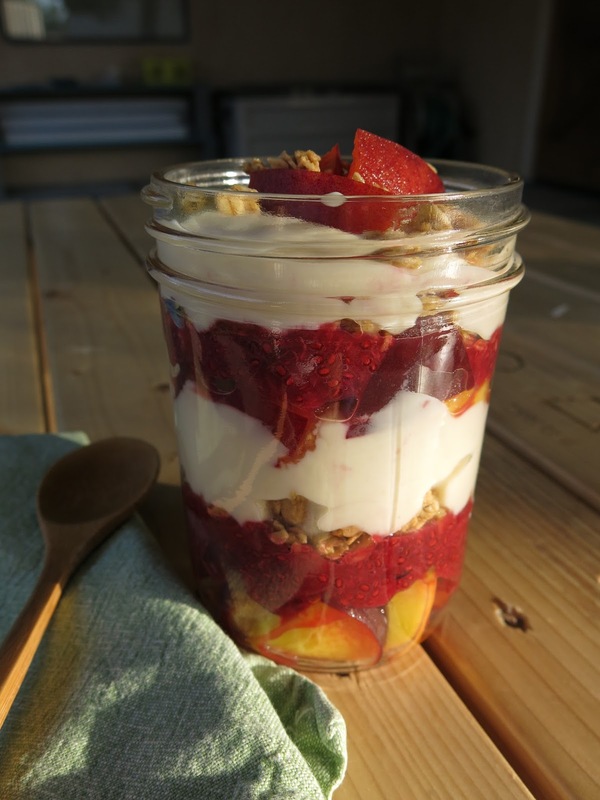 The perfect topping for toast, cereal, ice-cream, yogurt and breakfast parfaits. So naturally, that’s what I did with the plums. 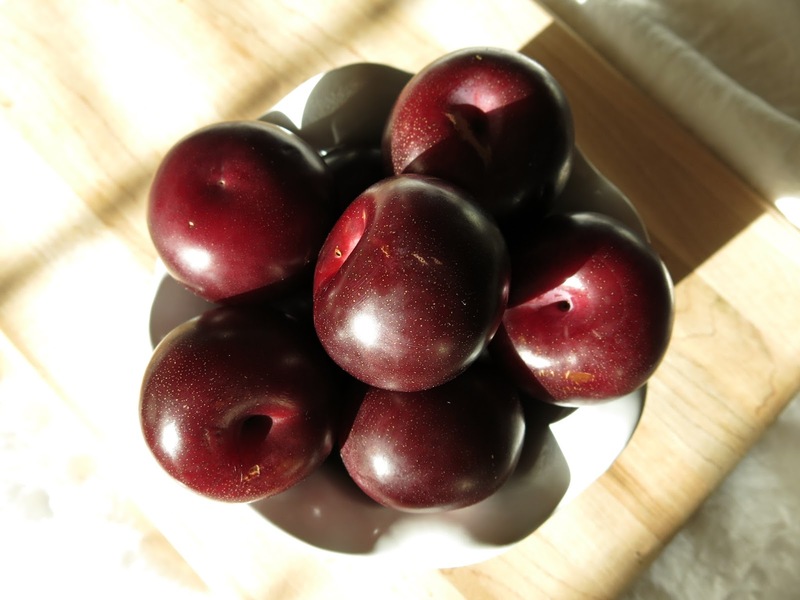 Nine lovely, perfectly ripe, sweet and juicy, purple plums yielded three cups of coarsely chopped fruit for my jam. 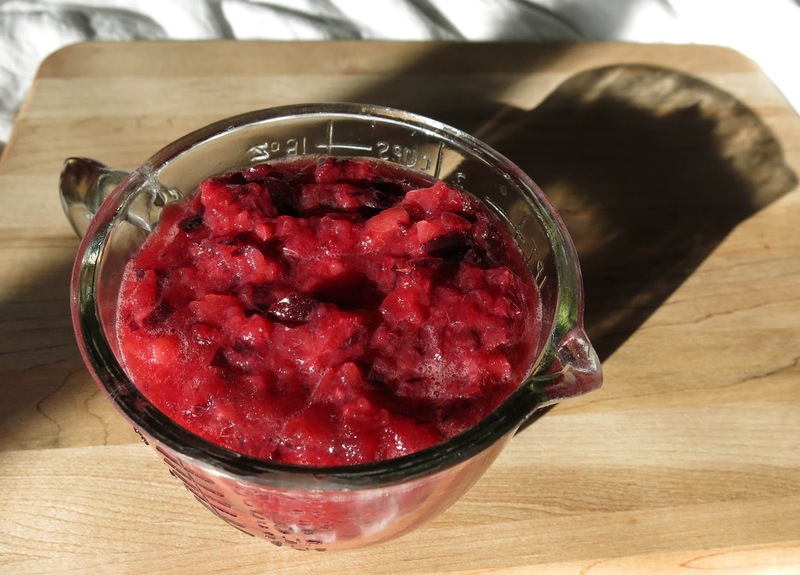 Simply cut them into chunks and pulse the plums in the food processor until coarsely chopped. In a pan, bring the fruit to a simmer, add your preferred sweetener (I used maple syrup) to your own liking, then add 2 tablespoons of chia seed. Chia not only acts as a thickener, but is also a great source of fiber, protein and a perfect opportunity to sneak in one of those superfoods. Simmer the fruit for a few minutes, let it cool, store it in an airtight container in the fridge and it will keep for a week or so. 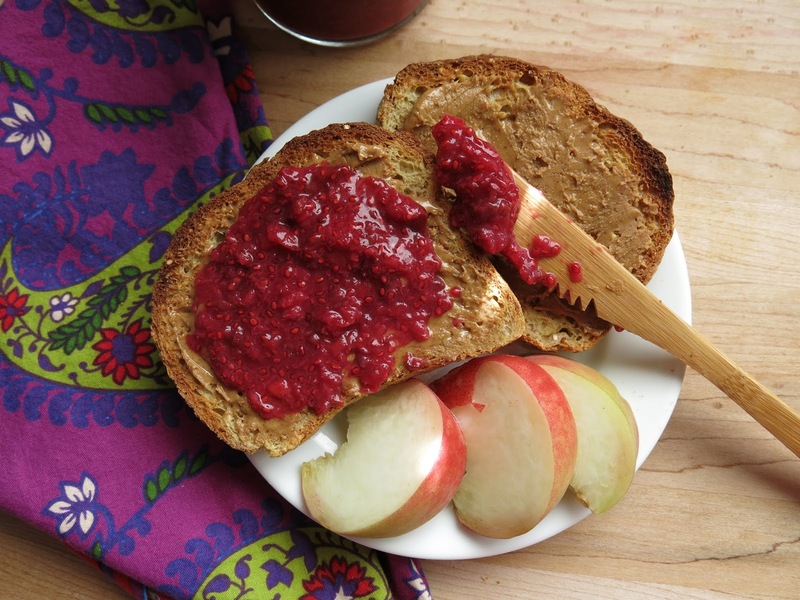 I enjoyed some chia plum jam as a mid-morning snack on gluten-free toast with almond butter and a few freshly sliced peaches, of course, on the side. 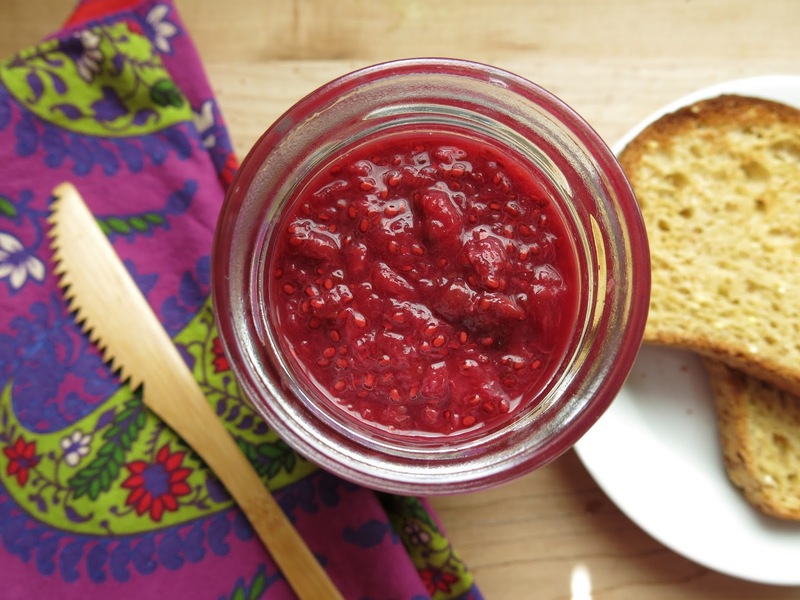 And in keeping with my grab-my-jar-and-go lifestyle, I just happened upon the perfect combination for my tartly sweet chia plum jam as I quickly rummaged for some kind healthy breakfast one recent morning. 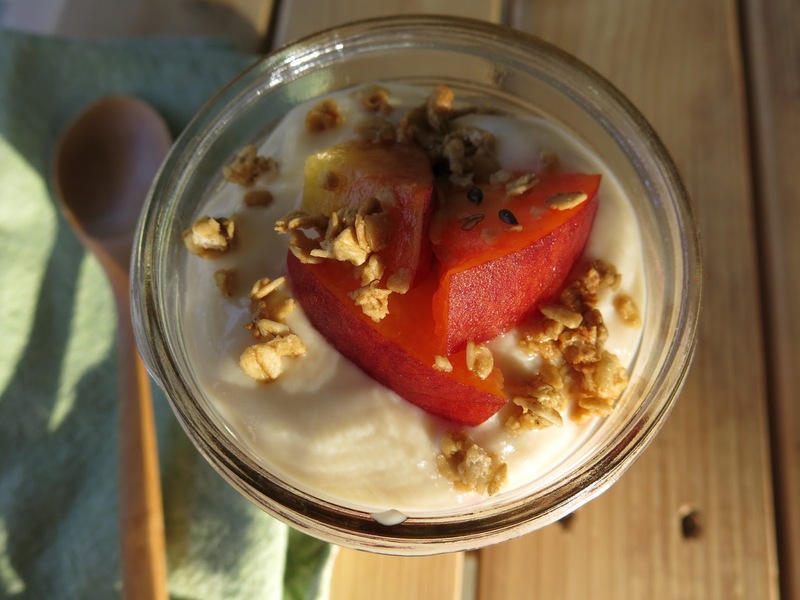 Layered in amongst sweet juicy peaches, vanilla soy yogurt (from a carton) and honey-flax granola (from a box), it made for a perfect last minute breakfast parfait for a busy, running-late workday. I enjoyed this parfait so much when I got to work! It was like eating homemade peachy-plum cobbler in a jar. Dessert for breakfast in the golden glow of that early hour…what a way to start the day.